In recent years, both T-Mobile and MetroPCS have undergone major changes in the way that eligible phones can be unlocked. Formerly, an unlock code was enough to make an original T-Mobile or MetroPCS phone available for use with any other network carrier. This was extremely beneficial for people interested in switching to a different carrier or even traveling outside of the United States. After the two companies made these changes, the only way to get a phone unlocked is through the “Device Unlock App”. This app comes already installed on any eligible phone. It is also available for download in the Google Play Store. As long as you have one of the qualifying Android devices (see list below), the app is the only option available for unlocking your phone. Using the app is very easy. All you have to do is open the app and tap the “Permanent Unlock”. Use either data or connect to wifi to ensure the success of this operation. The phone will restart and you will now have the option to use it now on any carrier. You can also try out our T-Mobile & Metro PCS Permanent Unlock service for faster unlocking. Take note that your phone has to have internet connection for this process to work. The only problem is that your phone has to be a qualifying or “eligible” phone. This means T-Mobile or MetroPCS have to check that your IMEI is clean and whitelisted. There are a lot of reasons that your phone might not be qualified to enjoy the benefits of the app. The most popular reason is that T-Mobile or MetroPCS has not registered your IMEI as eligible for unlocking. 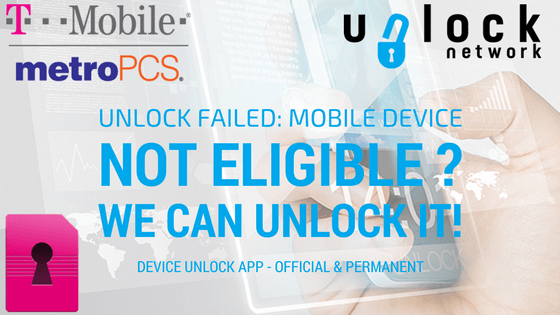 If your IMEI is ineligible, you will receive an error message: “UNLOCK FAILED: THIS MOBILE DEVICE IS NOT ELIGIBLE FOR UNLOCK”‘. At that point, you can only use either T-Mobile or Metro PCS carrier with your phone, because no other SIM card will work. We offer an unlocking service that is guaranteed to be of great benefit to you. T-Mobile & Metro PCS Permanent Unlock is a service we provide. With this, we can make your phone “eligible” for unlocking with either of the two carriers. All we need is your IMEI. After we unlock your phone, you will be able to open the “Device Unlock App“. You will instantly receive a confirmation message that your phone has been unlocked. You can trust that we provide the best services that we can in the shortest amount of time possible. We pride ourselves in completing even the most impossible unlock. When you try our service, your success is almost guaranteed. In the rare occasion that we cannot unlock your phone, we will send you a full refund of your money. With our services, you are completely protected and respected. We will never share any information you provide to us with a third party.